Here is a page for the paid member of “Listening skills training course“. If you are not good at listening to Japanese, the point of improving your listening skill is to listen Japanese a lot. Even if you read a lot of Japanese, you would not improve your listening skill. Some people think for improving the listening skill is to watch Japanese Anime or movies. However, these are made for native Japanese speakers, it is going to be very fast for Japanese learners. That’s why people who are beginner and Intermediate would be difficult to continue listening or watching anime and movies in Japanese. Then, how do you watch a lot of time Japanese anime and movies? The conversations of anime and movies consist of a sentence one by one. The point is, when figuring out the sentence one by one, you gradually understand what they are talking about. 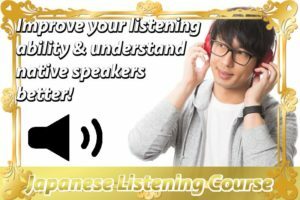 This “Listening skills training course” has been made from native Japanese speakers, so while you listen to them many times, you would be able to get used to listening to Japanese and naturally enjoy watching Japanese anime and movies. And this website doesn’t use the quite formal expressions such a textbook, this has been using more natural ones such as Japanese anime and movies. The sentences used in this website are so close to the words which native speakers have been usually using. The way to listening to that is to simply click a play button and starting voices of native speakers speaking. 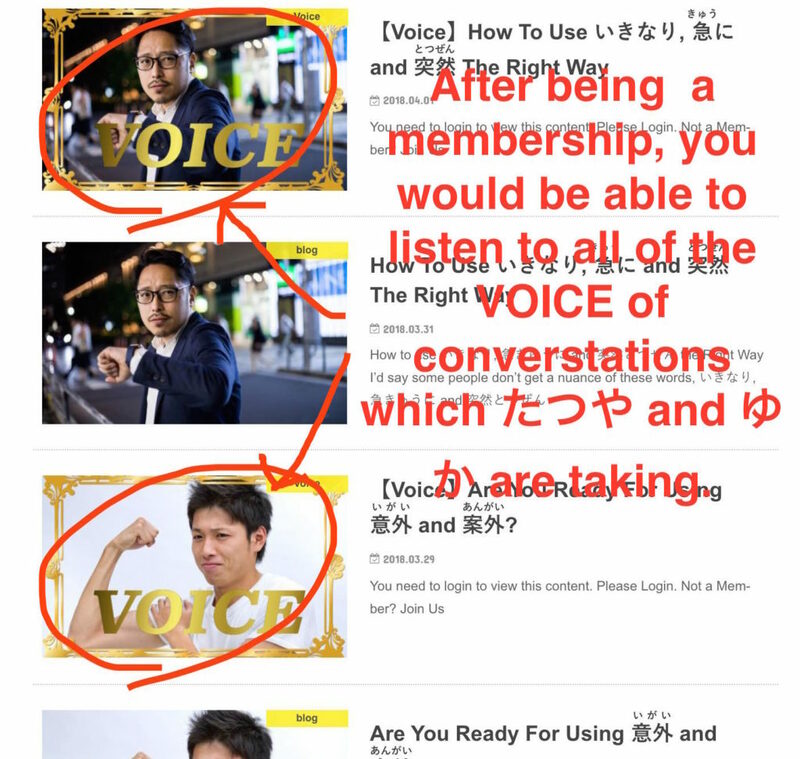 Furthermore, I have prepared three types of speed for beginner, intermediate and advance, so you would be able to listen to the voice of your level. First of all, starting the voice for beginner and it would be enough to figure out, then you could go to a next level which is intermediate. And if you get used to listening to them, challenge the voice for the advance which is as fast as native speakers are speaking, so after listening to it, you would be able to enjoy watching Japanese anime and movies. This “Listening skills training course” is basically $19.99 for a year, however, it is promotion now and half-off which is $9.99 for a year. Once you got a membership of “Listening skills training course”, you would listen to no matter what the contents you could listen. Please listen to these voice for beginner, intermediate and advance and make sure what level you would be suitable. What kind of voice was you suitable? Was that beginner or intermediate or even advance? If you were suitable for beginner, don’t worry about it. All you have to do to improve your listening skill is the amount of what you listen to the voice which native speakers speak. The voice used this website is short, so you won’t give up. And anytime and anywhere you could enjoy listening to them as much as you want. You don’t need to pay after being the membership. That costs $9.99 for a year which is promotion price. The way to pay it is only “PayPal”, so if you don’t have a PayPal account, you have to get it and use this service. Enjoy learning Japanese with this website for you and improve both your listening skill to watch Japanese anime and movies or even to talk with native Japanese speakers. If you listen to the voice many times until you figure them out or imitate what they are speaking, the practice would make you improve your listening skill. I hope you improve listening skill so much with this. *After paying it from PayPal, a registration page for paid members would appear. Would you mind registering the membership with your ID(e-mail address) and Password to enter the articles for paid members? After that, you could open the article for this “Listening skills training course”. If you don’t understand to use it, don’t hesitate to contact me.